Scottish & Southern Energy is favourite to build a £1billion-plus carbon capture plant to extract greenhouse gases from gas-fired power stations. Engineers at the Perth-based company have been working for months on plans to use a gas and steam turbine at a power station in Peterhead, Aberdeenshire, as a test bed for a small carbon capture plant. The Government has promised a £1billion contract for a company that can produce an effective design for CCS - carbon capture and storage - on a large-scale gas-fired power station. Scottish & Southern is believed to be the only company in the world developing this technology. Dozens of gas-fired power stations will be built in the next 20 years as old nuclear and coal-fired plants are decommissioned. 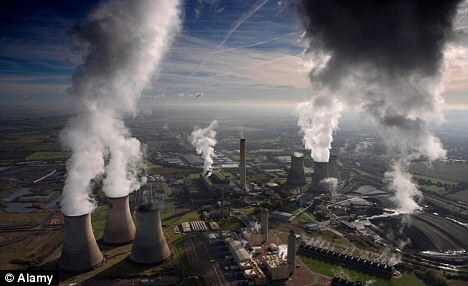 the Government insists that all these power stations should be ccS ready - that is they should have facilities to connect CCS plants. Plans for a different carbon capture scheme at Peterhead were shelved by oil giant BP in 2007 in protest at Government delays for funding such projects. But Scottish & Southern never gave up on the idea and has been secretly working on its own plans as Britain embarks on a second 'dash for gas' with dwindling North Sea supplies being replaced by imported gas. Scottish & Southern chief executive ian Marchant said in July: 'If long-term targets for reducing emissions are to be met, CCS technology is going to have to apply as widely as possible. this means gas-fired power stations as well as coal.' if the company reckons its technology will work - and early results are encouraging - it will apply to the Government to build the world's first CCS plant. Energy Secretary chris huhne believes Britain has the capacity to lead the world in this technology with countries like china having to clean up hundreds of coal fired power stations. the Department of Energy is running another CCS project, this one for coal-fired power stations, with another £1billion for the company that produces a working design. Another British group, Scottish Power, is the only one working on such a project and is expected to win the contract when the Government announces a decision next year. Shares of Cheniere Energy (AMEX: LNG) are exploding higher today, currently up by 15.32%, trading at $4.14. The company announced earlier that its subsidiary, Sabine Pass Liquefaction, LLC has signed a memorandum of understanding with ENN Energy Trading Co., Ltd., under which ENN Energy Trading intends to contract 1.5 million tonnes per annum of bi-directional LNG processing capacity at the Sabine Pass LNG terminal located in Cameron Parish, Louisiana. Under the memorandum of understanding, ENN Energy Trading and Sabine have agreed to proceed with negotiations of definitive agreements for ENN Energy Trading to contract capacity for a primary term of 20 years with mutually agreed extension terms, subject to certain conditions precedent, including but not limited to Sabine's receipt of regulatory approvals and making a final investment decision to construct the liquefaction facilities, and ENN Energy Trading reaching a final investment decision to construct an LNG receiving terminal. Shares have been running higher over the past two months and are currently trading above the 50-day and 200-day moving averages. Cheniere Energy, Inc. is an energy company primarily engaged in liquefied natural gas LNG-related businesses. The company owns and operates the Sabine Pass LNG receiving terminal in Louisiana through its 90.6% ownership interest in and management agreements with Cheniere Energy Partners, L.P. It also owns and operates the Creole Trail Pipeline, which interconnects the Sabine Pass LNG receiving terminal with downstream markets. China Huaneng Group Corp., the nation’s largest electricity producer, applied for an initial public offering for its alternative energy unit in Hong Kong, according to two people with knowledge of the matter. The Huaneng unit has hired Morgan Stanley, Goldman Sachs Group Inc. and Macquarie Group Ltd. to manage the $1 billion sale, said the people, who declined to be identified because the information is confidential. The Hong Kong stock exchange will hold a listing hearing this week, and the company aims to start trading next month, one of the people said. The IPO will add to the record $45.8 billion that 63 companies have raised through initial offerings in Hong Kong this year, according to data compiled by Bloomberg. Nick Footitt, a Morgan Stanley spokesman in Hong Kong, declined to comment, as did Goldman Sachs’ Edward Naylor and Paul Scanlon at Macquarie. Calls to Wang Hongmei, the director of China Huaneng’s news office in Beijing, went unanswered. China, the world’s largest polluter, is encouraging cleaner energy to combat climate change and to meet demand for power in the fastest-growing major economy. China erected more wind turbines in 2009 than any other country and may install a record 18 gigawatts of wind-power capacity this year, Bloomberg New Energy Finance estimates show. China plans to require power-network companies to buy a portion of electricity supplies from renewable energy sources, according to an Oct. 18 statement on the nation’s draft industrial development for 2011-2015. Renewable energy is one of seven “strategic” emerging industries that China aims to promote in the next five years. China Huaneng is the state-controlled parent of Hong Kong- listed Huaneng Power International Inc. China Huaneng plans to have 20,000 megawatts of wind-power capacity by 2020, or about 10 percent of its total estimated generating capacity by then, according to a company statement on May 25. China Datang Corp., the nation’s second-largest power producer, is also seeking a $1 billion IPO in Hong Kong for its renewable energy unit, two people familiar with the plan said on Nov. 3. A listing hearing will be held for China Datang Corp. Renewable Power Co. this month, the people said. President Dmitry Medvedev said Russia is looking to South Korean companies to help modernize his country’s industries and develop commercial applications in key technologies. Areas for cooperation include energy efficiency, medicine, space technology and computer sciences, he said. Medvedev’s visit comes on the heels of recent trips to China and Vietnam as Russia moves to increase its presence in Asia to benefit from the region’s growth, diversify its export markets and attract investment. Two-way trade between Russia and South Korea in the first ninth months of this year totaled $12.4 billion, 20 percent higher than the whole of 2009, according to data from the Korea International Trade Association. Russia bought $5 billion worth of South Korean goods between January and September in 2010, making it the 13th largest destination. Moscow-based OAO Gazprom and Korea Gas Corp. signed a “road map” to export Russian gas to South Korea. The two countries agreed to start talks on the subject, Gazprom Chief Executive Officer Alexei Miller told reporters today. Miller met with representatives from Korea Gas Corp. to discuss holding talks next month on deliveries of natural gas starting in 2017, he said. South Korea may import as much as 10 billion cubic meters a year, Miller said at the G-20 Business Summit in Seoul today. The gas may be delivered in liquefied or compressed form, or though a land pipeline, Miller said. South Korea imports 1.5 million tons of LNG a year from Russia. Europe remains the primary market for Gazprom, the world’s biggest natural-gas producer. Gas delivered to Asia may reach the same level as Europe within a “quite short” period of time, Miller said. The European Union currently accounts for half of Russia’s foreign trade. Gazprom warned the EU last month that its move away from long-term contracts may lead to a drop in supply for European customers and an increase in exports to Asia. Sakhalin Energy, a Gazprom-led venture, began shipping liquefied natural gas to Japan and South Korea last year and aims to sign a contract next year to supply China National Petroleum Corp. with 30 billion cubic meters of gas annually for 30 years. Medevdev and Lee also agreed to cooperate on “creating the conditions” for resuming the stalled negotiations on North Korea’s nuclear weapons program. Medvedev also said South Korea needs to engage in dialogue with North Korea to ensure regional stability at today’s meeting with Lee in Seoul, Lee’s office said in a statement. Movements of personnel and vehicles near a nuclear test site in North Korea have sparked speculation the totalitarian nation may be preparing for a nuclear test. Six-party multinational talks including Russia and South Korea on the North’s atomic weapons program haven’t been held since December 2008 as Kim Jong Il’s regime insisted United Nations sanctions be lifted first. North Korea has been under UN Security Council sanctions for its two nuclear tests in 2006 and 2009. The disarmament talks also include China, Japan and the U.S.
South Korea’s military said last month it was monitoring Punggyeri in North Korea’s northeastern North Hamgyong province after the Chosun Ilbo newspaper reported on Oct. 21 that movements may be related to preparations for a third nuclear test. A nuclear test by North Korea would be considered a “serious matter,” Admiral Robert Willard, commander of the U.S. Pacific Command, said in Seoul on Oct. 22. Terminale GNL Adriatico Srl, commonly known as Adriatic LNG, is the company that designed, built and operates the LNG Terminal located offshore Italy, in the northern Adriatic Sea. The company was established in 2005 by Qatar Terminal Limited (45%) - a Qatar Petroleum subsidiary, ExxonMobil Italiana Gas (45%) – an ExxonMobil subsidiary and Edison (10%). The Adriatic LNG Terminal is the world’s first offshore Gravity Based Structure (GBS) for unloading, storing and regasifying Liquefied Natural Gas (LNG). With its 8 billion cubic meters capacity, approximately equal to 10% of the country’s entire gas consumption, the Adriatic LNG Terminal will make a significant contribution to increasing and diversifying Italy’s traditional sources of energy imports, thus contributing to the security and competitiveness of Italy’s energy supplies. The importance of the project has been recognized by Italian and European authorities. The Terminal has been declared a project of Italian and European strategic interest respectively by CIPE (Interministerial Institute for Economic Planning) and by the EU Commission. The Adriatic LNG Terminal is the first ever offshore Gravity Based Structure (GBS) for unloading, storing and regasifying Liquefied Natural Gas (LNG). The facility is located offshore of Porto Levante, in the northern Adriatic Sea, about 15 kilometers off the Veneto coastline, where it is set on the sea floor. It is connected to the national network of gas distribution by a new pipeline. Overall, the offshore Terminal is designed around a large concrete structure, which houses two LNG tanks, and includes a regasification plant and facilities for mooring and unloading LNG vessels. It is overall 375 mt. long, 115 mt. wide and the main deck is 18 mt. above sea level, with the top of the flare tower rising 87 mt. above sea level. This state-of-the-art structure has been specifically designed to provide the Italian domestic gas network with a major new source of imported energy. Built with cutting edge technologies and boasting a highly innovative infrastructure, the Adriatic LNG Terminal is now ready to provide the nation with a safe and reliable energy supply. The Adriatic LNG has a regasification capacity of 8 billion cubic meters per year (775 million cubic feet per day), or approximately 10 percent of Italy’s current natural gas requirements. Eighty percent of the Terminal capacity will be utilized by Edison for a period of 25 years, to regasify LNG imported from Qatar’s North Field, as part of a supply agreement with RasGas II. The remaining 20% is open for third party access, out of which 12% has already been allocated according to the procedures defined by the Italian Ministry of Economic Development and the Regulatory Authority for Electricity and Gas. .
A consortium of BP, Edison, and chemical company Solvay plan to construct a 290-Mmcf/d LNG terminal on the site of a former Solvay chemicals plant near Livorno. In January 2005, Italys environmental ministry approved plans for the construction of the project. However, local government leaders have expressed opposition to the project, which could delay its planned initial production date of 2012. In March 2005, Spains Gas Natural (GN) presented plans to local officials for the construction of two LNG receiving terminals in Italy, located in the northern city of Trieste and the southern port of Taranto. Under its proposal, GN would build facilities at each location with production capacities of 770 Mmcf/d each, in order to fuel its plans to expand its presence in the Italian Natural Gas market. In the case of the Trieste site, Endesa would join with GN in the project, offloading much of the plants output for its nearby power plant. GN planned to complete the projects by 2010, though neither has yet to receive full regulatory approval. Royal Dutch Shell signed an agreement in August 2005 with Italys ERG to build an LNG receiving terminal next to ERGs Oil refinery at Priolo Gargallo, Sicily. 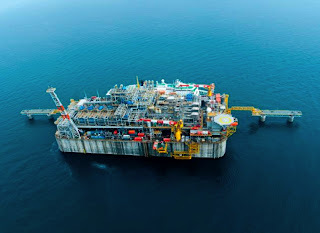 Shell stated that, pending approval of government officials, it would begin construction of the $510 million, 770-Mmcf/d facility by 2007, for completion in 2010. It is unclear if all of the proposed LNG projects will actually proceed to completion. It is unlikely that Italys domestic market could absorb this much new natural gas supply, especially considering the expansion of piped gas imports from North Africa. However, there has been some talk of using Italy as a natural gas hub, landing LNG there for re-export to the rest of Europe. ExxonMobil and Qatar Petroleum each hold 45 percent stakes in the proposed North Adriatic LNG project, an effort led by Italys Edison to build an LNG receiving terminal on Italys northern Adriatic coast. The project consists of a 770-Mmcf/d, offshore regasification facility near Rovigo, using LNG supplied by the RasGas II gas liquefaction project in Qatar. In May 2005, the consortium awarded a contract for construction of the main LNG recieiving terminal to Norways Aker Kvaerner. Edison has stated that it expects initial production from the project by 2007. The Italian city of Livorno, on Italys central west coast, has been considered as a site for two LNG proposals. In May 2004, the Offshore LNG Terminal (OLT) consortium received environmental approval for its proposed LNG receiving terminal near Livorno; OLT, composed of Golar LNG and Italys CrossGas, plans to permanently moor a standard LNG tanker offshore, convert it into a floating storage and regasification unit, then connect it to the coast via a sub-sea Pipeline. Once completed, the Livorno offshore facility will have an initial capacity of 390-Mmcf/d. In March 2006, Endesa purchased a 25 percent stake in the project. Construction is slated to begin in mid 2006, with completion by 2008. Our GE 10-1 dual-fuel turbine technology is powering the world's first gravity-based offshore LNG terminal, operated by Adriatic LNG, located 17 km offshore from the town of Rovigo, near Venice, on Italy's northeast coast. 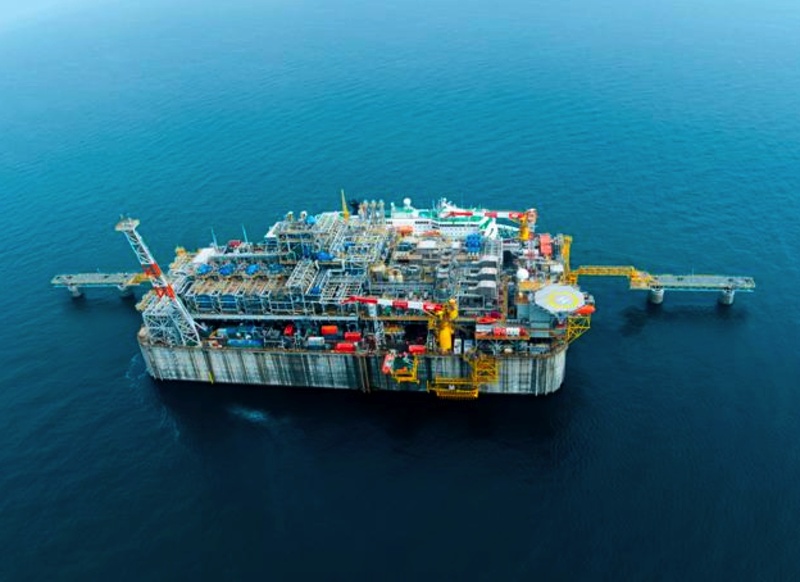 The terminal is moored in 30-m depths and is the world's first use of an artificial-island GBS for offshore LNG. At the heart of the engineering solution is an enormous reinforced concrete box that rests on the sea floor and houses two LNG storage tanks. The project also marks the first ever offshore deployment of a GE10-1 dual-fuel, low-emissions gas turbine system. The LNG terminal's operations are powered by three GE10 low-emission gas turbines – two GE10-1 single gas modules and one one GE10-1 dual-fuel gas turbine, providing a total power output of 30 MW to provide optimum energy efficiency. In addition, all three units feature GE's advanced Dry Low NOx (DLN) combustion system that achieves NOx emissions below 15 parts per million – enabling the mega-terminal to meet the stringent emissions reduction and environmental regulations prescribed by the Italian regulator. Tony Mercer, Project Manager, Aker Kvaerner says "GE Oil & Gas has risen to the challenge of delivering a fully modularized gas turbine power generation system that will help us save significant time during the construction and commissioning stages of the Adriatic LNG project. GE's positive attitude and desire to deliver to a tight production schedule was instrumental in overcoming many challenges. We look forward to working with GE Oil & Gas on future projects." The new gas terminal will increase Italy's regasification capacity by 200%. Ten stories high and covering an area larger than two soccer fields, the facility has two LNG tanks with a combined annual capacity of 8 billion cubic meters – representing around 10% of Italy's annual gas demand. The terminal receives LNG shipments from Qatar (80%), Egypt and Trinidad (remainder) twice a week. The LNG is regasified at the terminal, then transported to an onshore metering station before entering Italy's gas network. 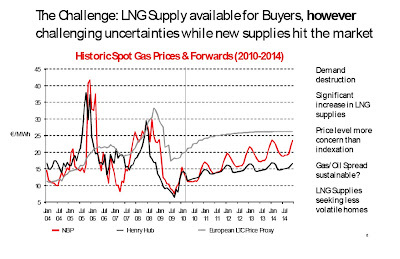 For more about the Adriatic LNG project, please click here. Italy is the third largest market for gas in the European Union, next to Germany and the UK. Gas consumption in Italy is forecast to rise from 73 BCM in 2003 to 100 BCM/y by 2010, fuelled in part by a boom in gas-fired power generation. Algeria and Russia are currently top gas suppliers to the Italian market. Morgan Stanley said it hired Maggie Jia from Mitsui & Co. as the U.S. bank’s first liquefied natural gas trader in Singapore. Jia, who has six years’ experience in LNG, joined in September and will be the New York-based bank’s “first dedicated LNG trader in Asia,” Sebastian Howell, a Morgan Stanley spokesman in London, said yesterday. 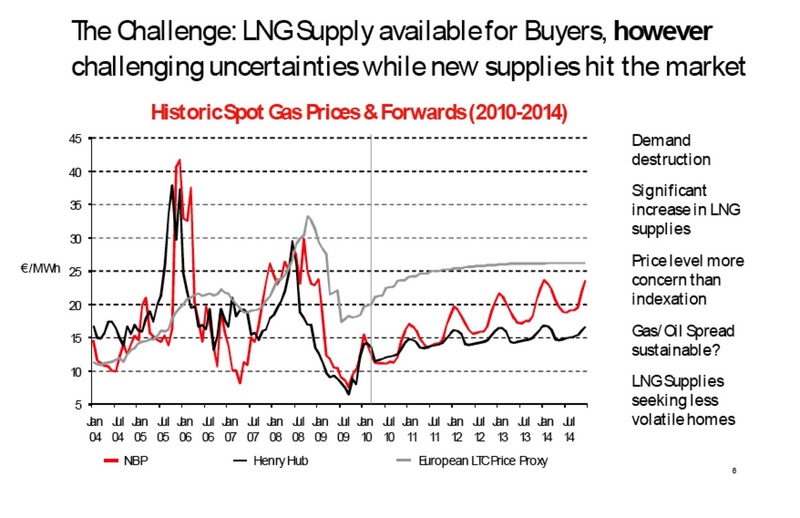 She will report to Luis Lesmes in London, head of LNG, Howell said. Morgan Stanley joins rivals such as Citigroup Inc. in setting up a LNG trading desk in Asia to capture increasing trade in the cleaner-burning fuel from China and India, as well as Japan and South Korea, the world’s biggest LNG importers. “It makes perfect sense to move people from Europe to Asia and we can only see this continuing,” said Tim Spragg, a recruiter at Commodity Appointments Ltd. in Singapore. Trading in LNG will increase as “the biggest liquefaction markets, including Qatar, Indonesia, and Australia, and also two of the largest regasification markets in Japan and South Korea” are in Asia, he said. Spot and short-term imports, which include contracts of as long as four years, were equivalent to about 30 million metric tons, or about 17 percent of global LNG trade last year, according to data based on BP Plc’s annual energy review and a report by the International Group of Liquefied Natural Gas Importers.